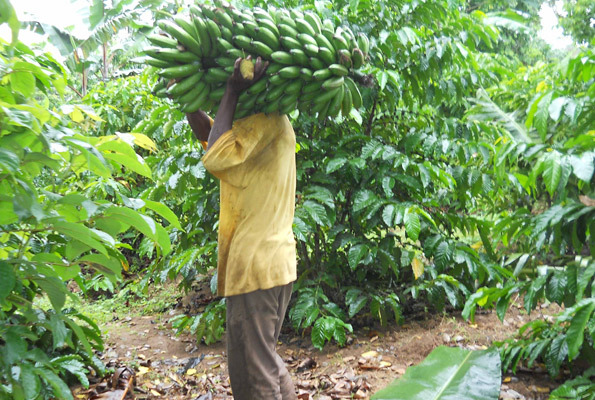 A farmer carrying plantain from his garden. It is a staple food for many Ugandans. While everybody knows the science behind global warming, to a polished few it is very much still a mystery, ‘the true source’ of this problem. Why? Well, how true is it that the developed nations produce the bigger percentage of emissions? This is a valid question. Also how do you determine what percentage agricultural activities contribute to Greenhouse gases? These are baffling questions even for the experts who compiled the data. That i think explains for the refusal, so far, of developed countries to renew the 1997 Kyoto protocol. This refusal(negotiations are still going on in Durban, South Africa) on the part of developed countries has ruffled the feathers of representatives from the developing countries who are seeking to have the protocol renewed/extended as a way to retain earlier commitments to reduce emissions. The developed world does not wish to be bound up in these agreements even as statistics continue to show that we all face a bleak future of apocalyptic proportions if we do not act. But who cares and whose world will it be when that time comes anyway? I bet you we will not miss the well until we have dredged it’s bottom for the last drops of water. Meanwhile as we squabble and maneuver to disengage ourselves from shared mutual responsibility, the world will keep turning. Life will go on for sure. Everyday the sun will rise but it will do so as a red ball of unbearable heat. When the rain falls it will wash away the crops and topsoil stratum. Then we will stare at the horizon. Perhaps then we will think of a distant disengaged God’s indifference to our plight.